Florida, like California, has a strong tradition of crime storytelling, and back in 2002 Jonathon King strengthened the Sunshine State's ranks when he debuted with THE BLUE EDGE OF MIDNIGHT. That novel introduced a fascinating and multi-layered hero, former Philadelphia cop turned private eye Max Freeman. It went on to win the prestigious Edgar Award for best first novel, and kick-started a terrific long-running series. 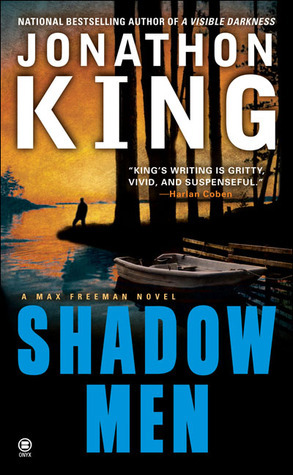 In SHADOW MEN, the third book in the series, Freeman is living in an isolated shack in the Florida Everglades when he's approached - via his good friend Billy Manchester, a lawyer - by the descendant of three men who vanished without a trace while working as labourers on a dangerous road building project 80 years ago. The client has discovered old letters from his ancestor detailing all sorts of injustices and horrors faced by those building the Tamiami Trail through the Everglades, horrors that may have lead to a violent end. King demonstrates a really nice touch for evoking this swampy corner of the world. From the opening chapter, he brings the Everglades vividly to life on the page – the atmosphere, the setting, and the history of an area filled with murky water and even murkier deeds. 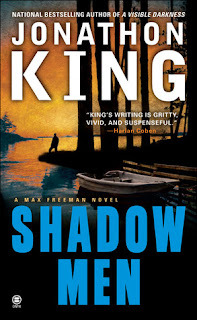 But SHADOW MEN isn't just a good crime novel with a great character in an intriguing setting: as we follow Freeman on his chase for a truth mixed in history and mystery, larger themes of corporate greed, the strength of family ties, senses of self, and more are all interwoven into the well-crafted tapestry. SHADOW MEN is a fine novel from a fine writer: packed with excitement, colour, and memorable, fascinating characters; highly recommended. I originally read this book and wrote a short review for Good Reading, a print magazine in Australia, back in 2012. This review is an expanded, more in-depth look - unconstrained by word count - at my thoughts on what is a very gripping book.